Six teams from the western division are as follows Press Soccer Club and City United FC of Lautoka,4R Electrical FC and Nailaga Sports of Ba and FC Gandhi and Namaka FC of Nadi. Eleven teams from the southern division are Lokia Football Club and Raralevu FC of Tailevu Naitasiri, Bureta FC and Civic FC of Suva,Lokia United and Nakasi Lions FC of Rewa,Koromakawa Football Club and Widova FC of Navua, Friends United and Chelsea Sports Club of Nasinu and Tai United FC of Northland Tailevu. Meanwhile the 2015 Rooster National Club Champions pool were drawn today at Fiji FA Headquarters in Vatuwaqa. In the Southern Division there are 3 Pools and in Pool 1 are Waidova Sports Club of Navua,Bureta FC of Suva, Friends United FC of Nasinu and Lokia United of Rewa. Pool 2 has Lokia FC of Tailevu Naitasiri,Raralevu Sports of Tailevu Naitasiri,Nakasi Lions of Rewa and Chelsea FC of Nasinu. In Pool 3 are Navua’s Koromakawa FC, Tai United of Northland Tailevu and Civic FC of Suva. 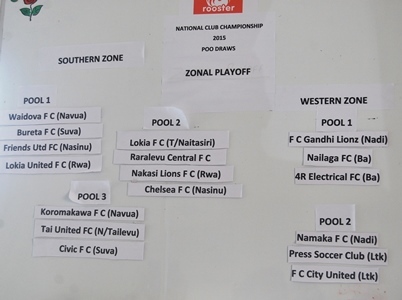 The Western Division has two pools and in Pool 1 are FC Gandhi Lions of Nadi,Nailaga FC of Ba and 4R Electrical FC of Ba. 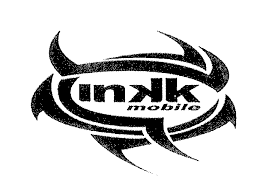 In Pool 2 are Namaka FC of Nadi, Press Soccer Club and FC City United of Lautoka. Five teams from south and three teams from west will qualify for the finals which will be played at Govind Park in Ba next weekend. The pool winners and 2 best runners up from south and pool winners and a best runner up from the west will play in the finals. The southern zone play offs will be played at Ratu Cakobau Park in Nausori from Saturday 28 and Sunday 29. The western division playoff will be held this weekend at Prince Charles Park in Nadi on Saturday 28. The final play offs will be held from December 4, 5and 6 at Govind Park in Ba.